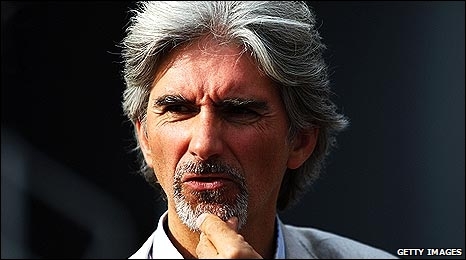 Former Formula 1 champion Damon Hill says the future of next year's British Grand Prix is far from certain because of competition from around the world. With contracted venue Donington Park struggling to find the cash to redevelop its circuit, Hill is trying to move the event to Silverstone. But he fears F1 supremo Bernie Ecclestone may look elsewhere. "F1 can go anywhere in the world and get a huge amount of money," Hill told BBC Radio 5 live. "That's what Bernie's wrestling with. But it's not his job to give a discounted job to the UK." The British GP has been held every year since 1948 and has a rich history, while recently English drivers Lewis Hamilton and Jenson Button have won 2008 and 2009 world titles respectively with Brackley-based Brawn also clinching this year's constructors' crown. "There's a whole load of reasons why it should happen here," Hill added. "But ultimately you are competing against countries which are able to inject public money into their infrastructure and into the contract of the grand prix. And that seems to be the stumbling block here." The proposed move to Donington Park on a long-term contract was announced in July 2008, but a deadline passed on Monday for the company redeveloping the circuit to prove it had the £135m funding required. In June, Ecclestone has said there would definitely be a British GP in 2010 and that it would be at Silverstone if Donington failed to come through. But more recently he has backtracked and said it is not certain there will be a grand prix in Britain next year at all. He said on Friday: "I want a British Grand Prix, of course, but we are not going to do special rates for Britain. "If they [Silverstone] can't make it work then don't do it. If that happens, there won't be a British Grand Prix. Simple as that." Hill, 1996 F1 world champion, is now president of the British Racing Drivers' Club which is negotiating a deal to take the race back to Silverstone, although he is not directly involved in those talks. But he believes Ecclestone, who has long criticised the lack of investment in upgrading Silverstone, could take up the chance to earn more money elsewhere by giving the slot in the calendar to a country such as Korea, which is on the provisional grand prix list for 2010. "He [Ecclestone] can get a value globally that is far in excess of what he can get for the UK," Hill said. "We can respect that it is a difficult position for him to be in. He has to answer to his shareholders. "There are options on the table. There are discussions taking place and I'm hopeful something can be sorted out." The British GP was almost was dropped in 2005 because of a dispute between Ecclestone and the BRDC, which refused to pay the race fee he had demanded. The race was left off the provisional race calendar but was reinstated after negotiations produced an agreement. Silverstone has hosted every British Grand Prix since 1987, while Donington, which is synonymous with MotoGP, has held only one F1 race, the European Grand Prix in 1993.